Communities in the area will benefit from the massive Dorenell Wind Farm that is currently under construction about five miles from Dufftown. However, developers EDF Renewables have only offered to pay villages £2,000 per MW of electricity generated every year instead of the £5,000 recommended by the Scottish Government. The power firm claims other benefits, including a visitor centre dedicated to the wind farm and upgraded paths on the site, will make up some of the difference to locals. 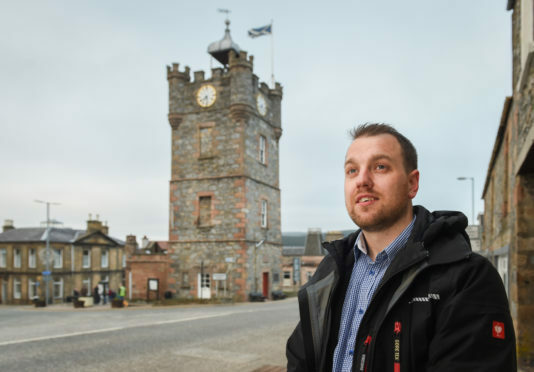 But Fraser McGill, a member of the United Communities Impact Group, which represents Dufftown, Glenlivet, Inveravon, Glenrinnes and the Cabrach, believes the promises will make little difference. He said: “We feel the additional aspects of community benefit originally offered are failing to actually deliver benefit as they are centred on the Glenfiddich estate – this leads us to think that it is the landowner that actually benefits, not the community. Mr McGill now wants to meet Matthieu Hue, managing director of EDF, in order to press the case that the communities are entitled to the extra cash. The difference between the recommended figure and the total currently on offer from the firm means a potential £27.5million over the course of the turbines’ 25-year lifespan could be slashed to £11million. Moray MSP Richard Lochhead said: “It’s astounding that this multi-billion pound company is unwilling to respond positively to the concerns of the communities. Once complete, Dorenell will have 59 turbines, which will be more than 400ft tall. It is expected to generate energy for 84,000 homes annually when operational. An EDF spokeswoman said: “The overall community package will be worth nearly £4,000 per MW, including significant added benefits such as the upgrading of paths and creating warden and ranger posts, and the creation of a visitor centre. Last week, the Press and Journal revealed bungling EDF bosses had ordered the wrong size of turbine parts, which were then convoyed to the site. Six parts will now need to be removed and replacements transported in – at an estimated cost of at least £180,000.